Those who work in the healthcare sector are exposed to many unique risks; ranging from employment liability to directors and officers liability, to accidents resulting in the injury of a patient or staff member. Some of these risks become even greater when healthcare workers tend to their patients in a private home. The most common accidents that befall home healthcare aids are slips and falls, overexertion, incidents with hostile pets, and even car accidents while traveling to work or running errands for the patient. So, how can your clients put a focus on safety and encourage their employees to do the same? First off, home healthcare aides should always be aware for their surroundings. Working in a person’s home is understandably unpredictable, unlike a controlled hospital environment. Aides should always be aware of the neighborhood they’re in, any pets the patient or patient’s family has, and any other factors about the home that might be of importance such as any home renovations going on or structural issues. In addition to being aware, home healthcare aides should always practice good body mechanics in order to avoid overexertion. Back injuries from moving or lifting people are one of the greatest risks to nurses and other healthcare workers that work with adult patients. 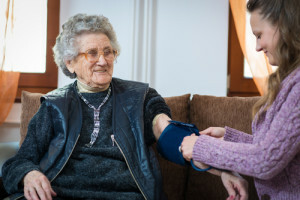 Sometimes it may even be wise for two home healthcare aides to be assigned to one patient, to make patient transferring and other tasks a little easier with the extra support. Another risk for home healthcare workers is foot injury. While not frequent, occasionally a patient will request that any visitors remove their shoes in their home. While this may be a reasonable request, home healthcare aides should instead opt for surgical shoe covers, to avoid potentially stepping on something sharp or stubbing their toe and injuring themselves. The above methods are just a few ways that home healthcare aides can focus on safety. It’s also important for aides to be aware of potential hazards; slippery bathroom floors, cupboards that are left open, etc. Following basic safety protocols could help your clients reduce their Home Health Insurance risks. With Care Providers Hospice Community coverage, your clients will have access to a flexible and comprehensive insurance program to cover their risks and safeguard against liability losses, property damage, and accidents. Please contact us today at (855) 632-6787 to learn more about our coverages.